While sweepstakes provide an eff ective marketing tool, in the United States a careful balance has to be struck between state and federal lottery laws, and the use of third-party I P rights. The Canadian Anticounterfeiting Network has released an executive update to its Report on Counterfeiting and Piracy in Canada: A Road Map for Change, calling on the government to get tougher on IP crime. 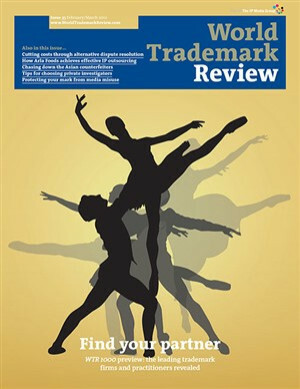 In Chartered Institute of Patent Attorneys v Registrar of Trademarks (Case C-307/10), Advocate General Both as stated that Office for Harmonisation in the Internal Market (OHIM) Presidential Communication 4/03, which supports the ‘classheading-covers-all’ approach to registration, does not offer sufficient clarity. The Australian government has approved the country’s Plain Packaging Bill, meaning that tobacco products will be sold in generic packaging from December 2012. The move has sparked anger among brand associations, with tobacco companies heading to the courts to continue the fight. In Nokia and Philips (Joined Cases C‑446/09 and C‑495/09), the Court of Justice of the European Union (ECJ) has specified the conditions under which goods in transit can be seized by European customs authorities. Although the decision expanded on the circumstances in which temporary detention is permissible, it still places a heavy burden on brand owners. Keep calm or get litigious? After PepsiCo – are we any closer to harmonisation of design rights?